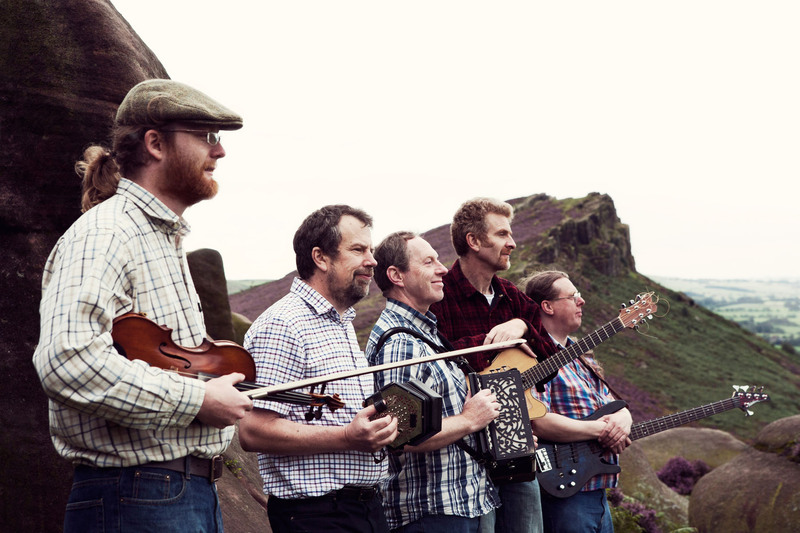 Since forming in 2001, Albireo have become firm favourites in the Greater Manchester area, with appearances at Poynton Ceilidhs, Phoenix Ceilidhs, Ryburn 3 Step, Liverpool Contra and other dance clubs in the North West. The band play a mixture of tunes. Most are English, Scottish, Irish or American, but others come from further afield and there are some self-penned compositions as well. The emphasis is on folk dance tunes, but we’ll also throw in in-between tune sets or songs for those with weary feet. As well as our local appearances, we’ve been heading out of the area to festivals and ceilidhs. Coming up in 2018 are several days at Broadstairs Folk Week. We’ll also be back at Whitby Folk Week for a late night Zesty Playford, and In Sept 2018, we’ll be making our first international appearance as a band, playing for the Paris Contra! In the past we’ve played at Oxfolk Ceilidhs in Oxford, Unicorn Ceilidhs in Hitchin and Coventry Zesty Playford — we made repeat visits to Coventry and Oxford in 2017, the latter being an interesting challenge on a very snowy weekend in December. In April 2016, we were delighted to play for a Playford Weekend with Andrew Swaine at Halsway Manor. In 2017 we spent a couple of days at Eastbourne International Folk Dance Festival, playing for workshops and evening dances with a variety of callers. We also played again at Chester Folk Festival in May and made a third appearance in a row at Whitby Folk Week for a late night Zesty Playford. These follow on from appearances at Whitby Folk Week in 2015 and 2016 and our debut at Sidmouth in 2015 providing music all week for the Social Dance programme along with a couple of Ceilidh appearances. Other past festival gigs include a great few days at Broadstairs Folk Week in 2014 and several appearances at Chester Folk Festival. We also had the great pleasure of playing for the 2017 Wincle Beer Festival! Details of all upcoming gigs can be found on the gigs page. Listen to our new album Binary. Howard Jones: Melodeon, Anglo Concertina, Hammered Dulcimer, Recorder, Vocals. Steve Hodgskiss: Piano, English Concertina. Peter Crowther: Bass Guitar, Keyboard. We provide a caller for dances, or we’ll happily work with your caller or MC, or simply play tunes if you prefer. We also bring our own high-quality amplification, so you’ve got no worries about hiring an expensive PA rig or your guests’ ears being assaulted by tunes that sound like they’re being played down the ‘phone. Oh yes, and of course we’re covered by public liability insurance and the equipment’s PAT tested to comply with the Electricity at Work regulations. Albireo are available for private bookings. We’ve played for weddings, corporate events, birthday parties, conferences, PTA hops and harvest festivals, and are used to fitting in with your existing arrangements. If you and your guests have never been to a ceilidh, ceili, barn dance, hoe down, folk dance or whatever you want to call it before, don’t worry! The caller is there to ensure that everyone has a good time. He or she will introduce the dances and make sure you and your guests are happy with the way the event’s going. If you’re thinking of booking us – or any other ceilidh band – for your event, you may want to check out our advice on organising a ceilidh. Also, please feel free to contact us by email or phone if you’ve got any questions or to discuss any particular requirements.